While the majority of the North Coast rivers are back on the rise following the rain earlier in the week, I’m wondering if anyone really cares? The spotlight has — and will continue to be — squarely on the Smith River. And for good reason. When fishable, the Smith has given up trophy-sized kings on a daily basis since the first big rain. 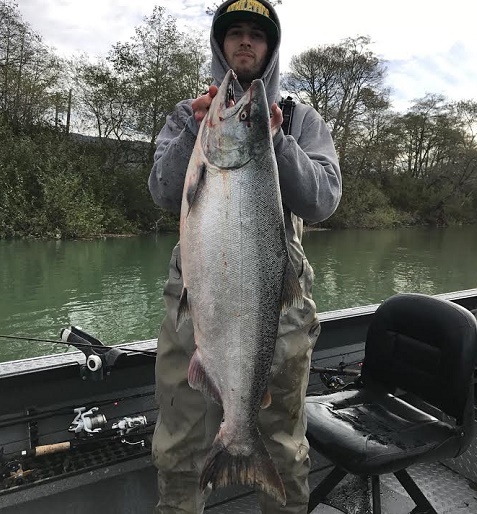 After dropping into shape last Friday, the Chetco took some of the boat pressure off the Smith, and pumped out some very big kings as well. It was not uncommon to see multiple 30-pound salmon landed on both rivers every fishable day. With the forecast calling for off and on rain for the next week, expect both of these rivers to remain the epicenter for coastal king fishing. According to Reginald Kennedy of Eureka’s National Weather Service, we’re still in the middle of a wet pattern, with off and on rain in the forecast for the next week. “In Humboldt and Del Norte Counties, Thursday’s rain could drop up to a half to an inch of rain. Another quarter to a half is likely to fall on both Friday and Saturday. Sunday is predicted to be a little wetter, with a half to one inch possible in both counties. Monday is looking dry at the moment, but periods of light rain are in the forecast for Tuesday. A wetter system will arrive on Wednesday, with potentially two inches falling,” Kennedy added. 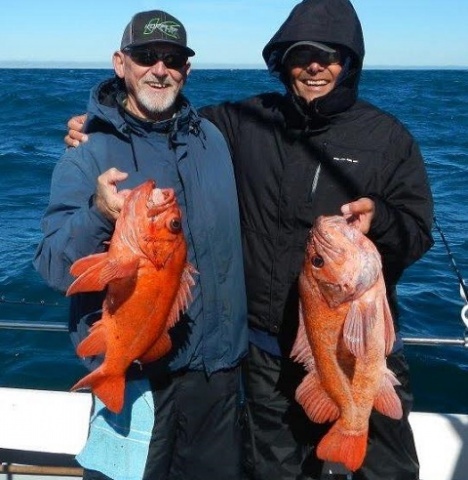 The recreational rockfish season for boat-based anglers will come to a close on Monday, Oct. 31. The weekend weather doesn’t look to promising for a last minute run to the Cape, or anywhere for that matter. Friday’s forecast is calling for winds out of the south 5 to 10 knots and 7 foot waves at 15 seconds. The winds will increase up to 15 knots on Saturday, with SW waves 4 feet at 7 seconds and NW 11 feet at 16 seconds. Sunday isn’t looking much better, with winds out of the south 5 to 10 knots and SW waves 6 feet at 9 seconds and NW 9 feet at 15 seconds. The Dungeness crab sport fishery is scheduled to open statewide on Saturday, Nov. 5. According to DFG Senior Marine Biologist Pete Kalvass, who oversees the Invertebrate Management Project, CDFW will begin collecting crab next week for meat yields, weather depending. For more information regarding recreational Dungeness crab fishing regulations and other crab species, please visit the DFG Marine Region website. Reminder: A North Coast Salmon Report Card is required to fish for salmon on the Smith River. The daily bag and possession limit is 1 Chinook salmon and no more than 5 wild Chinook salmon per year. 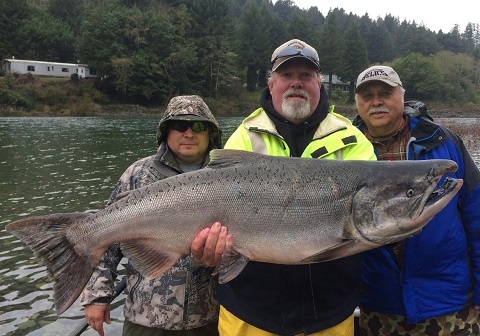 According to guide Andy Martin of Wild Rivers Fishing, the Chetco first came into shape last Thursday afternoon, once it got down to 4,300 cfs. “By Friday the river was below 4,000 cfs and fished great from top to bottom. Most guides got three to eight kings a day. According to Martin, the river was high on Tuesday and likely to blow out the rest of the week. Anglers are reminded that from the power line crossing at RM 2.2 upstream to Nook Creek (RM 14) from Sept. 1 through Nov. 3, angling is restricted to fly angling and bobber angling only, with 1 single point hook. Fly angling gear must include a strike indicator. Bobber angling gear must include a bobber and a leader no longer than 36 inches in length. Any weight (except the bobber or strike indicator) may be no more than 36 inches from the hook when suspended vertically. The leader below the bobber or strike indicator must remain suspended in the water column and not resting on the river bottom. The daily/seasonal bag limit is 2 Chinook daily, only one may be unclipped. 20 seasonal, no more than 5 may be unclipped.